The following terms and conditions apply to all contracts in which Shades Ltd. (“The Company”) acts as seller. “We/Us/Our” means Shades Ltd of 61 Hatford Road, Reading, Berkshire, RG30 3JB. When we use the words “writing” or “written” in these Terms & Conditions this will include by email. Signing of an order for supply or installation of blinds, curtains or other Goods from the Company shall be conclusive proof that the buyer has accepted these terms and conditions as being the only ones affecting any contract between the buyer and the Company. b. A visit from our salespeople visits you at your home, office or other location: the Contract will be formed when you sign the Order Form. Such orders will be subject to the Doorstep Selling Regulations and your rights under these regulations are clearly set out in the Order Form. c. Placing an order whilst visiting our trade premises: the Contract will be formed when you sign an Order Form. If you wish to cancel a Contract with us please refer to section 3 of these Terms to see if cancellation is permitted, and, if so, how to go about doing it. If we wish to cancel the Contract we can so in accordance with section 4. We always try to deal with the Contract as quickly and efficiently as possible, but sometimes we will be unable to do so. Any times stated by us are therefore estimates only. The Price will include all taxes applicable from time to time, but please note that we may have had to make certain assumptions when pricing the Installation – please note in particular section 5.3 below. Our Order Form will give details of the payment terms for your Order. We will debit the Price from your debit or credit card accordingly if you have supplied us with your card details. Payments by cheque are not deemed to have been made until the cheque has cleared. Subject to clause 3.2, as the Goods we will be supplying to you are made-to-measure Goods and are made to your requirements, you will not be able to cancel your Order once made (but this will not affect your legal rights as a consumer in relation to any Goods that are faulty or not as described). If you Order during a visit from one of our salespeople to your home or place of work, your rights to cancel are clearly outlined on the Order Form. If you are entitled to cancel the Contract, and wish to do so, you will be responsible to pay the reasonable fees and costs we have incurred already fulfilling our part of the Contract including loss of profit to date up to the overall value of the Order. If you have received the Goods before you cancel the Contract, please contact us as soon as possible for guidance on how to pack your Goods and arrange for them to be returned to us. If the Contract includes Installation, you may not cancel or terminate the Contract if, for any reason, you should decide that you will not allow us to Install any safety device that accompanies the Goods. In such circumstances, you will still be liable to pay us the full Price due under the Contract (but this will not affect your legal rights as a consumer in relation to any Goods that are faulty or not as described). We reserve the right to cancel the Contract or decline your Order if we have insufficient stock of the fabric or product required to manufacture and/or supply the Goods you have ordered; or any of the Goods in your Order was listed at an incorrect price due to a typographical error or an error in the pricing information made by us and/or received by us from our suppliers. Before cancelling your Order we will do our best to source and offer you suitable alternative Goods of a similar style and quality, but you are not obliged to accept them. If we do cancel your Order we will notify you as soon as possible and will credit to you any payment already made to us relating to your Order. Although we appreciate that you may be disappointed in such circumstances we will not be able to offer you any compensation for disappointment you may suffer. The product information and photographs contained in our Sales Literature are provided for illustrative purposes only and we cannot warrant that they are accurate. Whilst every effort is made by us to ensure that Goods sold and delivered to you or installed in your home match in every respect any sample or description we may have shown or given or sent to you, minor or immaterial variation or change in colour or pattern between the sample or description and the Goods delivered shall not entitle you to reject the Goods nor to claim any compensation for such variation or change. We can make the Goods according to the measurements you provide us. You can find information and tips on how to measure in our Sales Literature or on our website or by contacting us. If you are providing us with your own measurements please ensure that they are correct and accurate. 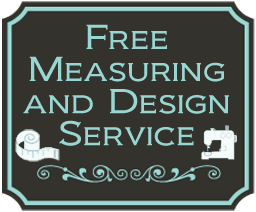 Unfortunately, we cannot accept the return of made to measure Goods if the reason for the return is because you provided us with incorrect measurements. We warrant that all Goods sold to you will be free from material defects for a period of 36 months from delivery of the Goods to you. As a consumer, you have legal rights in relation to Goods that are faulty or not as described in addition to the above warranty. Advice about your legal rights is available from your local Citizens’ Advice Bureau or Trading Standards office. Nothing in these terms will affect these legal rights. The warranty given in clause 7.1 above does not apply to any defect in the goods arising from fair wear and tear, wilful damage, abnormal storage, negligence by you or any third party, failure to use the Goods in accordance with the instructions, any unauthorised alterations or repairs or any specification provided by you. if you so request, arrange for a full refund of the Price of the defective Goods by crediting your debit or credit card or sending you a cheque within 30 days of receipt of the defective Goods. If the Goods are not defective, or have been modified, misused or the subject of negligence, you will be responsible for the payment of our charges on a time and materials basis in respect of any repairs and collection and return of the Goods which we agree to carry out at your request. someone who is not one of our staff or explicitly accredited has removed or refitted the Goods. Before commencing Installations we use our knowledge of good building practice to decide if we should fit into a particular area. It is up to you to tell us if you know of any cables or pipes hidden in the wall, and we will not be held responsible for striking such fittings. We shall not be liable to you nor be deemed to be in breach of contract by reason of any delay in performing, or any failure to perform, any of our obligations in relation to the Contract, or for any damage or defect to Goods delivered that is caused by any event or circumstance beyond our reasonable control including, without limitation, third party default, strikes, lock-outs and other industrial disputes, breakdown of systems or network access, flood, fire, explosion, accident, breakdown of manufacturing or other equipment or unavailability of raw materials. In these Terms we do not seek in any way to limit your statutory rights, nor to limit our liability for any death or personal injury resulting from negligence on our part. We will only use any information you give us in relation to your Order for the purposes of processing your Order, providing the Goods and/or Installation for you and to inform you of similar products or services that we provide. Please let us know if you would rather not receive such marketing correspondence. If you are ordering from us online details of our treatment of your personal data will be detailed there, and you will be given the option to opt in or out accordingly. This contract is subject to English law and the non-exclusive jurisdiction of the English courts.